Nutella Hot Chocolate is an easy, decadent and creamy hot chocolate that is bound to please all hazelnut chocolate lovers. It’s heaven in a cup on a cold winter’s day. 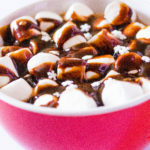 My hot chocolate recipe collection is growing fast and furiously thanks to the awesome Hot Chocolate Extravaganza that I’m running on my blog these days. Whether it’s this Three-Ingredient Creamy Homemade White Hot Chocolate, or luxurious French Hot chocolate or this citrusy Orange Hot Chocolate that you first choose to make, I can guarantee you won’t be disappointed! I mean, come on. I obviously had to do a Nutella Hot Chocolate, didn’t I? This was one of the first ideas I came up with while brainstorming for I Knead to Eat’s Hot Chocolate Extravaganza. And boy oh boy what a great idea it was. Wait a moment while I pat myself on the shoulder. Lol. 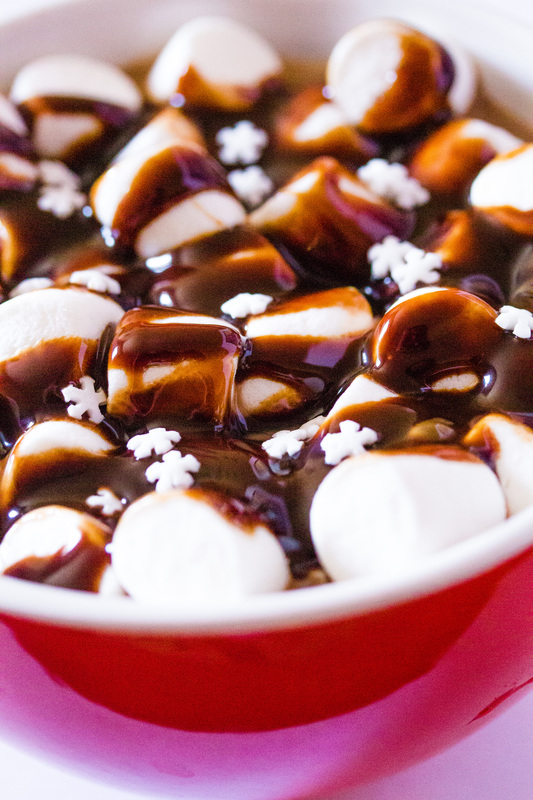 This was the quickest and easiest hot chocolate to make. I mean all of them are pretty easy, but this was really super simple to make. So How Do You Make Nutella Hot Chocolate? Then you take a saucepan, and warm milk in it. Then you add the rest of the magic makers: NUTELLA! Cocoa powder. And sugar. And then you whisk away, while basking in the delicious Nutella steam. And then you pour this Nutella Hot Chocolate into mugs. And you can share with your dear ones. Or maybe not. I won’t tell. Hehe. 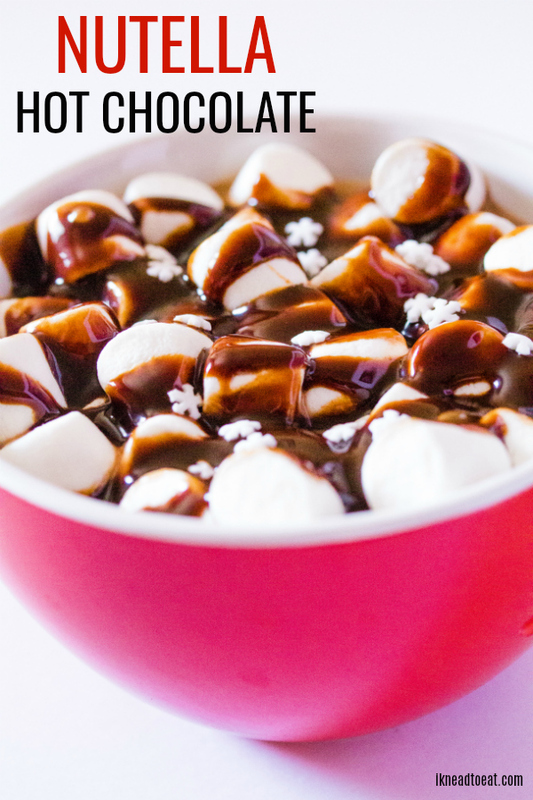 Can You Make this Nutella Hot Chocolate in the Microwave? 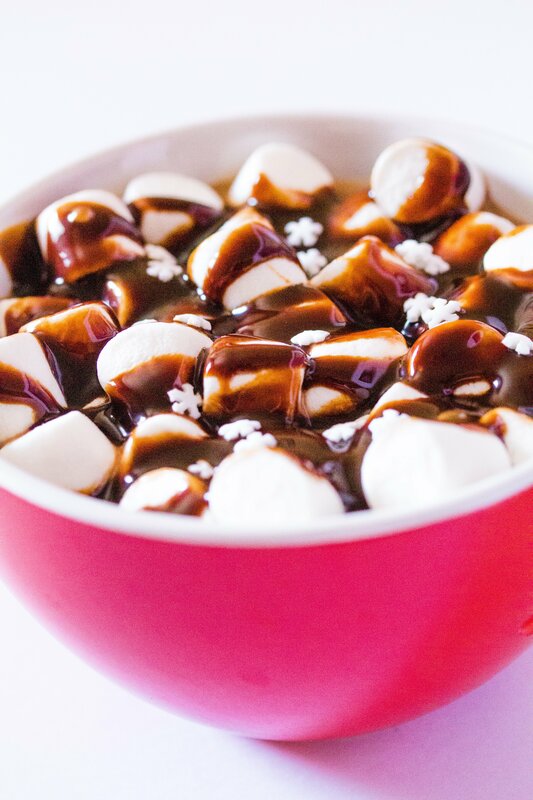 I haven’t tried this myself, but I think it should be okay to make this Nutella Hot Chocolate in the microwave. Just heat milk in a microwave safe mug, take it out and whisk in the rest of the ingredients. You just need to make sure that the milk is warm enough so that all the ingredients get combined. And that’s about it. Now go off, and make that steaming hot mug of this Nutella deliciousness! Nutella Hot Chocolate is an easy, decadent and creamy hot chocolate that is bound to please all hazelnut lovers. It’s heaven in a cup on a cold winter’s day. Gently heat milk in a saucepan, and then add the Nutella, cocoa powder, cocoa powder and sugar. Whisk until the milk is hot and all the ingredients have combined. Remove from heat and pour into mugs. 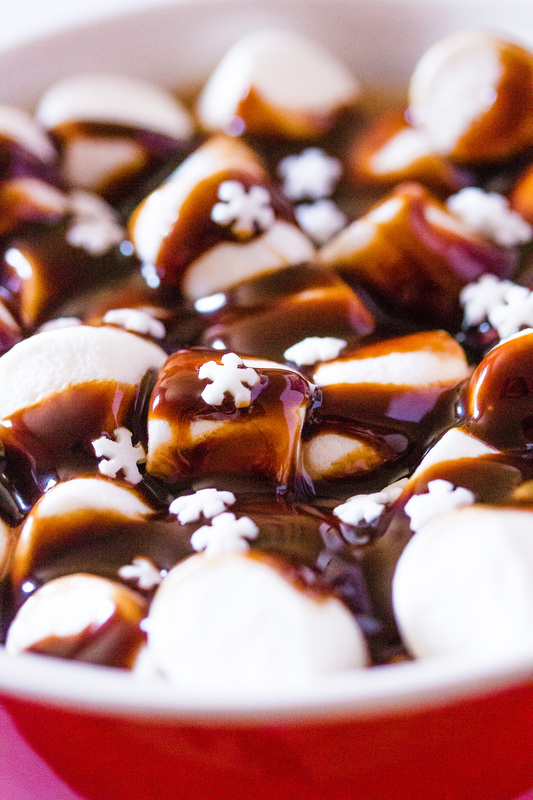 Top with marshmallows, chocolate syrup and snowflake sprinkles. Nutella Hot chocolate can be stored in an airtight container up to 3-4 days in the refrigerator.